"...It was the first time she had traveled by herself." Oatmeal, Haggis, Suet and Cryptozoology, anyone? Featured on Princeton University's literacy blog with a fun art activity: Natty Nessie Neckwear. Check it out! This was the very first drawing I did to get into the feeling of the book. It has very little to do with the action of the story, but it helped me to pre visualize where was to to take the art. 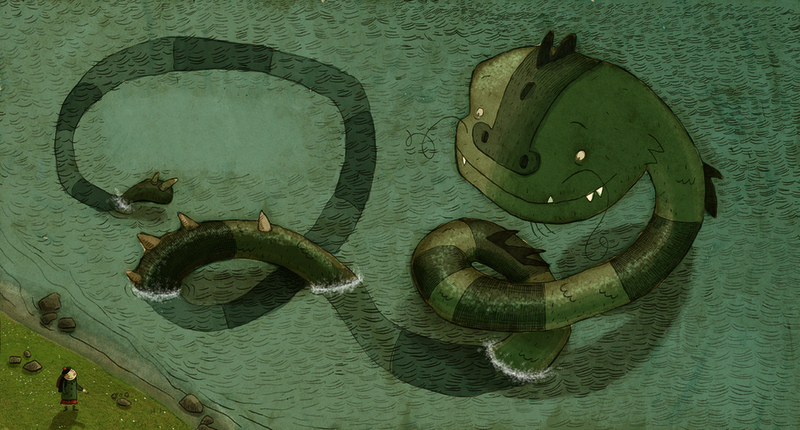 Study for monster—a mix of sea monster, Chinese dragon and worm. I had one idea for this jacket. Fortunately, it was the one used by the publisher! Lots of visual reference work here to get the furniture and costumes right. So fun. One of my favorite sketches for this book. Tons of reference work on this book which I absolutely LOVED. One of my favorite time periods, early 1900s, that is.